Warning! 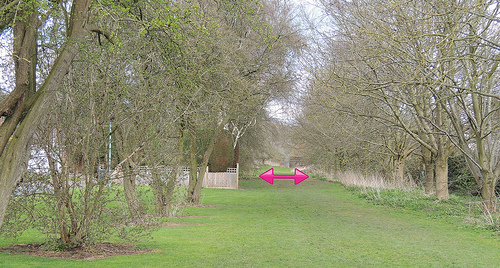 - The following access details were correct at the time of my walk - but may now have changed. Another Warning! - Although renovation is taking place, this route has been long derelict. Remember that this route should not be thought of as a public right of way. note that breaking a leg in the middle of nowhere is hazardous to health. 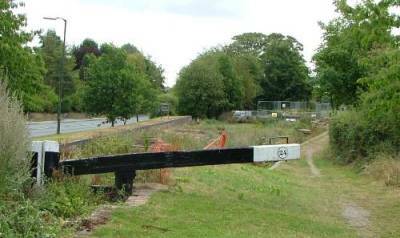 The BCNS sign pointing towards Huddlesford reads "(being) restored by Lichfield and Hatherton Canals Restoration Trust"
The word "being" is on a separate plate that can be removed when the line is reopened ! This shows the confidence that the canal will be passable again in the not too distant future. Distance in italics is for the original canal measured from Wolverhampton or Ogley Junction. Miles and furlongs - don't have a clue? Those were the measurements when the canals were built. In metric a mile is 1.61 kilometres. A furlong is an eigth of a mile or 200 metres. Ogley Junction (or Anglesey Junction) 16 miles 3 furlongs from Horseley Fields Junction, Wolverhampton. 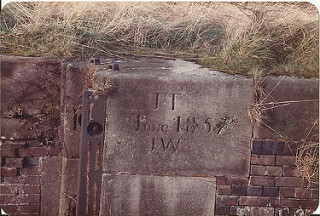 The bridge is marked "HORSELEY IRON WORKS 1829". 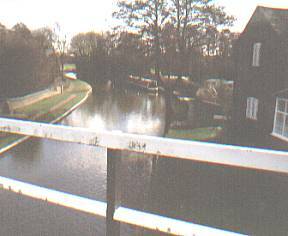 Taken looking East, toward where the first of 30 locks that drop to Huddlesford Junction. 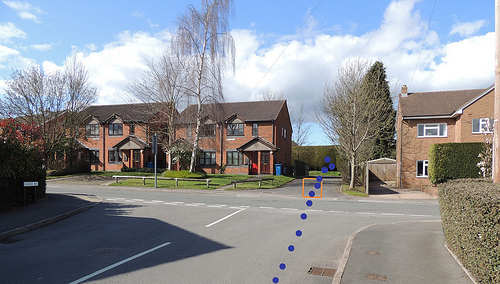 Access via Lichfield Road, Brownhills. Marina at the head of the (currently disused) locks down toward Huddlesford Junction. Lock Cottage, 271-272 Lichfield Road is visible between the trees. Taken looking East from Ogley Junction Bridge. Rise of 9ft 6in (2.9m). Ogley 1st. Flight Lock 2 0 miles 228 yards or 0.21 Km from Ogley Junction (back of Grassmere Gardens). Rise of 8ft 2in (2.5m). Ogley 1st. Flight Lock 3 0 miles 335 yards or 0.31 Km from Ogley Junction. Ogley 1st. Flight Lock 4 0 miles 459 yards or 0.42 Km from Ogley Junction. Rise of 10ft 2in (3.1m). (Original) Barracks Lane Bridge - Barracks Lane, off Lichfield Road. Where the humped back bridge would have been if it had not been removed to flatten the road over it. Looking West from Barracks Lane near the bottom of the flight of locks down from Ogley Junction. The corner-stones of lock 5 can just be made out. 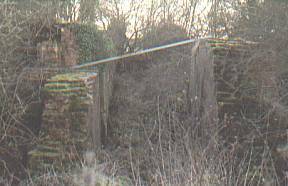 The top of lock 5 can be made out partially obscured by the wall of a PRIVATE access to a nearby dwelling. 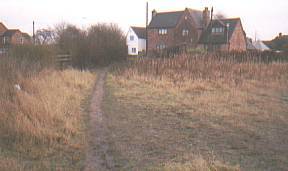 The original towpath is to the left and follows to line of the hedgerow. Ogley 1st. Flight Lock 5 0 miles 603 yards or 0.55 Km from Ogley Junction. Rise of 8ft 10ins (2.7m). Ogley 1st. Flight Lock 6, 0 miles 3¼ furlongs from Ogley Junction. Rise of 8ft 2ins (2.5m). NEW Rise of 0ft 0ins (0.0m). 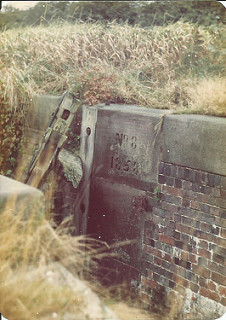 (Original) Lock No.8 as it was in October 1981. 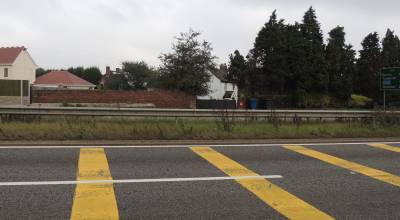 The photo on the left is of the westerly end of the lock, that on the right is of the lower easterly end (taken from what is now the fast lane of the M6Toll motorway!). (Original) Ogley 1st. Flight Lock 8, 0 miles 5¼ furlongs from Ogley Junction - which will be buried. 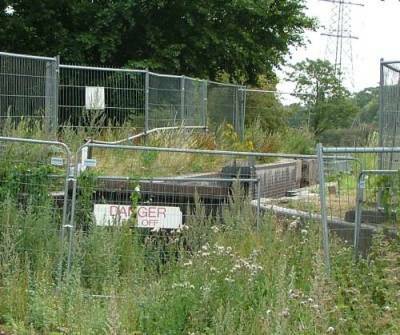 (Original) Lock No.8 reverting to nature in April 2003 and about to be lost to cater for the M6Toll motorway. The photo is a repeat of that above. 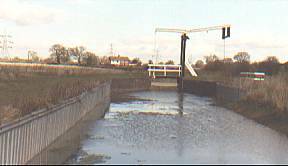 The lock lowered the water level from the higher Brownhills side. To keep the canal high enough to pass over the new motorway the level will not drop until after crossing the new road. 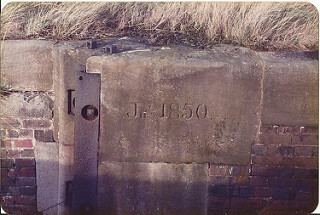 This original lock will be lost under a short embankment leading to the aqueduct that is currently being built. A new lock 8 will be constructed on the far side of the aqueduct. route required for the re-opening of the Lichfield section of the Wyrley and Essington Canal. 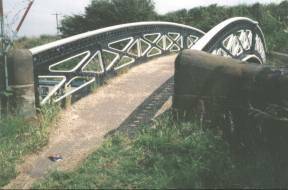 The crossing was built with government support, a large donation from The Manifold Trust, the work of Lichfield and Hatherton Canals Restoration Trust and the co-operation of the motorway's builders (CAMBBA). The motorway is operated by MEL (Midland Expressway Ltd.). 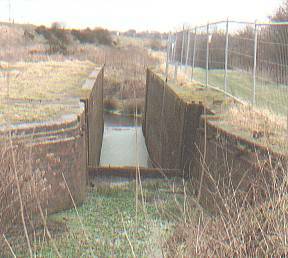 The canal will be held within a steel aqueduct constructed by Rowecord Engineering Ltd. of Newport, South Wales. 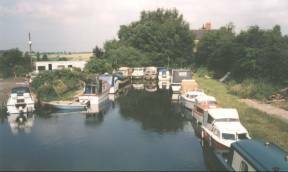 The photograph (above left) of April 2003 shows the concrete structures with the soon to disappear lock 8 just out of the picture to the right. It aqueduct was placed on the concrete structures over the weekend of 16-17/8/2003. 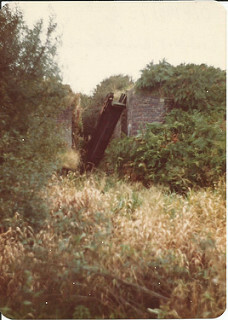 The photograph (right) of April 2015 shows the 45 by 8 metre steel aqueduct. The "MEGALOCK" ---- In a change to the original plan, the installation of two new locks to replace Locks 7 and 8 will be combined into one very deep lock. From LHCRT - "On Friday, 6th March 2015 Lichfield MP, Michael Fabricant, formally cut the first sod for the work which will see the reinstatement of a culvert and small aqueduct which was demolished when the M6 Toll motorway was built. 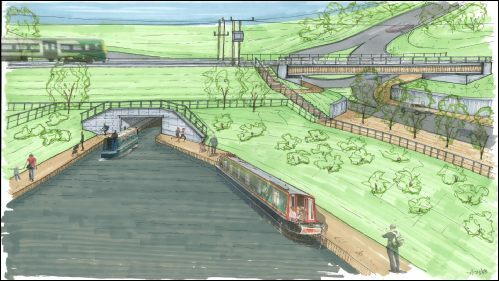 This structure will enable the Lichfield Canal Trust to reinstate the canal right up to the aqueduct which the Trust had to install before the motorway opened to traffic in 2003. In the immediate future there will only be a walking route from the Boat Inn to Barracks Lane but this will open up the canal route to the general public. 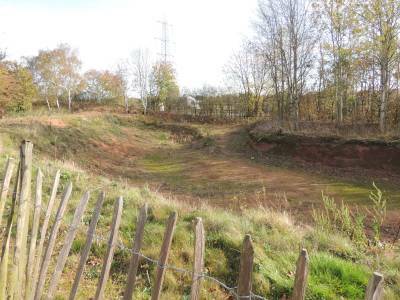 This has been made possible because the Trust managed to attract a substantial funding grant at the turn of the year to open up derelict canal land linking Lichfield and Brownhills." The culvert will be 43 metres long. 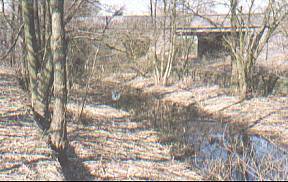 The level of the old canal bed can be seen on the left of the photo. New Lock will have a rise of 7ft 10in (2.4m). "In an exciting new proposal Mark Deadman, a director of WCL Quarries Ltd. revealed a possible plan to turn Cranebrook Quarry adjacent to the canal at Summerhill into a Marina. When the quarry is finally exhausted instead of filling it in and returning it to heathland it could be connected to the restored canal and turned into a marina. 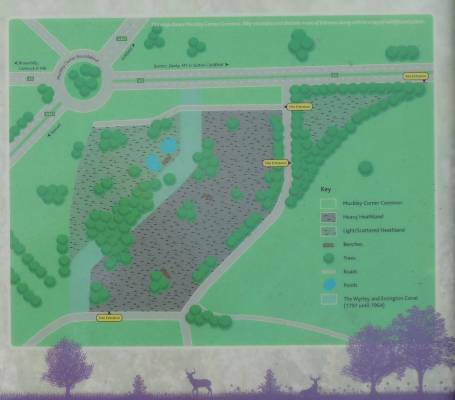 It would also provide valuable water storage for the canal." New Lock will have rise of 8ft 2ins (2.5m). The canal crossed the road at the side of the Boat Inn public house (to the right of this photo). 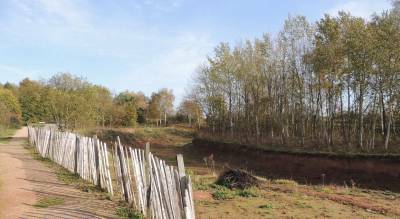 The long dry canal is currently being developed as a Heritage Towpath Trail. 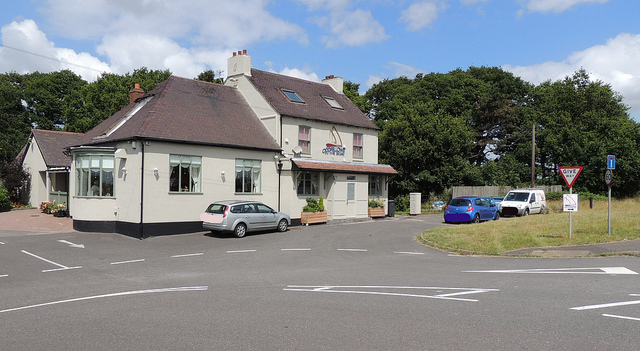 Access to the canal walk is to the right of the the pub by the white pillar and gate. (NEW) Ogley 2nd. Flight Lock 9A 1 miles 581 yards or 2.14 Km from Ogley Junction. New Lock will have rise of 4ft 7in (1.4m). Boat Lane The canal followed the line of the lane on its northern side. 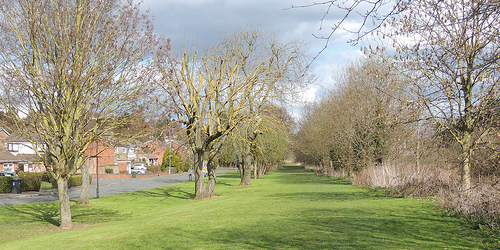 "Muckley Corner Common, or Wall Butts Common as it is officially known, is an area of former heathland lying south of the A5 Watling Street at Muckley Corner, between Wall and Brownhills, approximately 7.5 hectares in size. 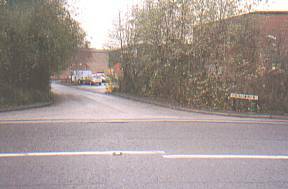 The site is divided into two by Cranebrook Lane, which extends from Watling Street towards Stonnall. 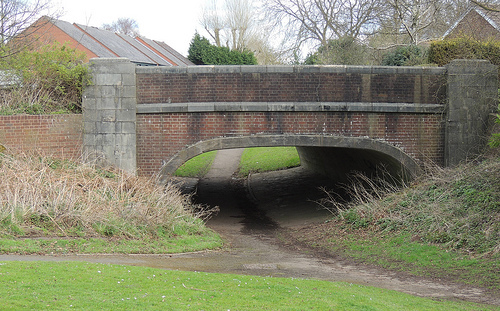 The Wyrley and Essington Canal ran through the site from 1797 until its closure in 1954. 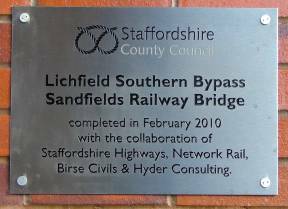 The canal was purchased by a private owner, while the rest of the site is owned by Lichfield District Council." New Lock will have rise of 4ft 3in (1.3m). Danks Cottage (now the white house - "Wharf House") and wharf was the original crossing point - the new crossing will be a little to the right. Ogley 2nd. Flight Lock 9 2 miles 50 yards or 3.25 Km from Ogley Junction - the proposed new route will by-pass this lock. Rise of 0ft 0in (0.0m). Ogley 2nd. Flight Lock 10 2 miles 253 yards or 3.45 Km from Ogley Junction - before bridge. Rise of 8ft 10in (2.7m). Muckley Corner Bridge Walsall Road (A461 - north from Muckley Corner) The canal passed under the bridge at the junction of Walsall Road and Wall Lane. Ogley 2nd. Flight Lock 11 2 miles 458 yards or 3.64 Km from Ogley Junction - adjoining bridge. rise of 8ft 6in (2.6m). The infilling under the bridge has been removed and steps layed down to towpath level. 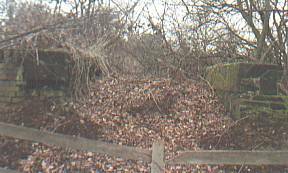 Coppice Lane Lock No.12 is still clearly visible but full of accumulated junk. Ogley 2nd. Flight Lock 12 2 miles 669 yards or 3.83 Km from Ogley Junction with a rise of 9ft 6in (2.9m). 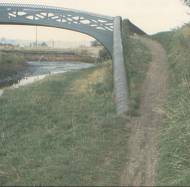 The large pipe viewed from the road shows where the canal would pass under a road bridge. 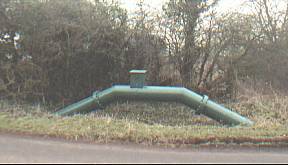 (A461 - Pipe Hill) --- Walsall Road crosses a triple bridge with arches from south to north - canal - farm track - railway. The photo on the left was taken from the west side of the bridges, looking north. The photo on the left was taken from the east side of the bridges looking back to the west. 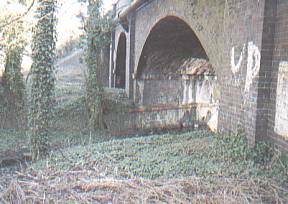 This photo (taken in March 2003) shows the straight metal beams of the railway arch that will shortly be replaced. 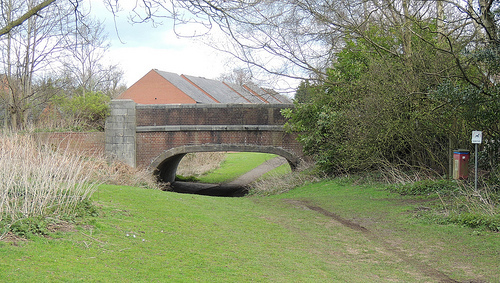 Also shown are the brick sides of the canal and the size of the trees that have grown in the canal bed since closure. Ogley 3rd. Flight Lock 13 3 miles 704 yards or 5.47 Km from Ogley Junction with a rise of 8ft 6in (2.6m). Ogley 3rd. Flight Lock 14 3 miles 792 yards or 5.55 Km from Ogley Junction with a rise of 8ft 10in (2.7m). Ogley 3rd. Flight Lock 15 3 miles 862 yards or 5.62 Km from Ogley Junction with a rise of 9ft 6in (2.9m). Ogley 3rd. Flight Lock 16 3 miles 915 yards or 5.76 Km from Ogley Junction with a rise of 8ft 10in (2.7m). Ogley 3rd. Flight Lock 17 3 miles 1126 yards or 5.86 Km from Ogley Junction with a rise of 9ft 2in (2.8m). The photo to the left is probably Lock 15. The photo to the right is probably Lock 17. New from the LHCRT in 2014. "Over the coming months sections of the Lichfield Canal Towpath will be opened to the public to form the Heritage Towpath Trail. 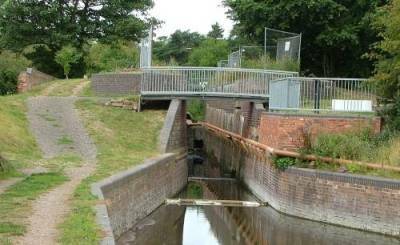 A Brochure and Interactive Map will be issued showing how the Lichfield Canal wraps around the City, including links into the City and other paths, walks, cycle routes etc as well as heritage information." 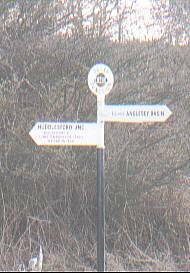 Lookout for signs from here to Huddlesford Junction. 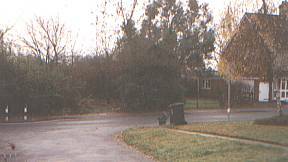 Fosseway Lane --- A couple of hundred yards on from Fosseway Lane lock 18 was cleared and renovated in May 1996. 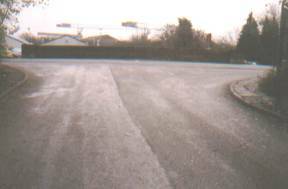 This photo of March 2003 taken looking east with the railway line higher up on the left. Ogley 3rd. Flight Lock 18 3 miles 1302 yards or 6.02 Km from Ogley Junction. rise of 9ft 10in (3m). Falkland Road, Sandfields (Lichfield Southern Bypass) the line of the canal crosses the road and passes between the railway embankment and the new flats. 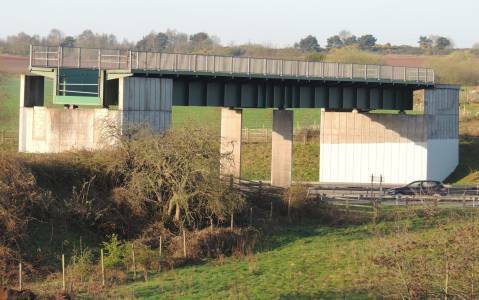 These photos of February 2010 taken looking east with the railway line higher up on the left crossing the new bridge. The canal bed is on the far right of the photo. On the left are large stone blocks from the canal ( moved due to the road building.) The new road is lower than the canal and not in view. 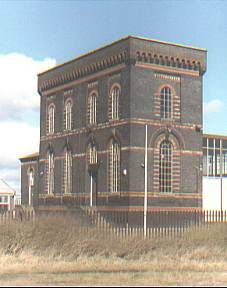 The Friends of Sandfields Pumping Station aim to ... "To ensure the safety, conservation, security and accessibility of Sandfields Pumping Station". Chesterfield Road - Taken along the line of the canal toward Lichfield with the houses of Chesterfield Road ahead. From here the route enters a built up area that has removed most traces of the line of the canal. The rebuilding of this section will loop to the south and rejoin the original route just before London Road. The canal crossed the road a little to the east of the railway bridge. Lock 21 was immediately befor the road crossing. Photo taken from Sanders Way looking north - 5/4/2016. 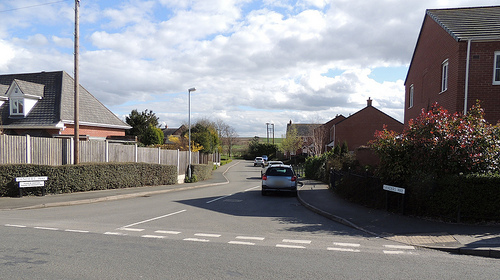 Old photo taken looking north from the footpath that has now become the road "Sanders Way"
Photo taken from "Kings Mews" looking south down Sanders Way - 5/4/2016. Across the road the canal followed the line of what is now Sanders Way (previously just a muddy footpath) and curved round to the east to a public open space that would become the route of The Darwin Walk a little farther along. Is Sanders Way named after John Sanders? The Darwin Walk is an original memorial to a unique individual. Erasmus Darwin (1731-1802). From 1756 to 1781 Erasmus lived in Lichfield and in 1985 the late John Sanders, a vice-president of the Lichfield Civic Society, had the idea of creating a 10 mile walk encircling the city to commemorate Erasmus Darwin's association with Lichfield." 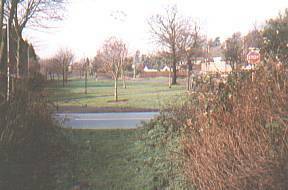 Old photo taken looking south towards the footpath that has now become the road "Sanders Way"
Photo taken looking east along the line of the original canal showing the public open space that becomes the route of The Darwin Walk a little farther along. The site of the original lock 22 is in this area  level with the west end of Wordsworth Close that can be seen in the distance to the left. Photo taken looking east from the end of Sanders Way - 5/4/2016. 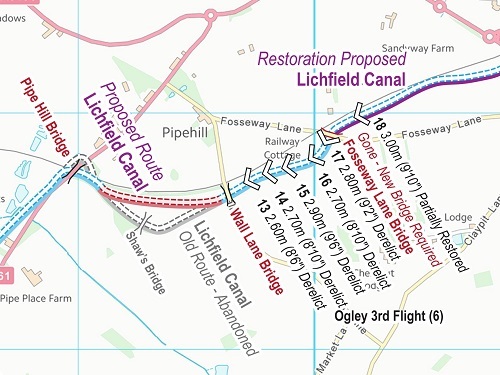 The new line of the canal will follow the south-west side of Falkland Road (the new A461 southern bypass) and will pass under the merged Claypit Lane / Fosseway Lane. Photo taken 5/4/2016 - looking south-west with Claypit Lane straight ahead and Fosseway Lane turning to the right behind the line of the canal. New Lock 19 4 miles 792 yards or 7.16 Km from Ogley Junction. Rise of 8ft 2in (2.5m). New Lock 20 4 miles 898 yards or 7.26 Km from Ogley Junction. Rise of 8ft 2in (2.5m). New Lock 21 4 miles 1003 yards or 7.35 Km from Ogley Junction. rise of 8ft 2in (2.5m). The site of Locks 19/20/21 of the new route. The new line of the canal will follow the right hand (south side) of Falkland Road (the new A461 southern bypass) and will drop down three locks and pass under Birmingham Road directly ahead. 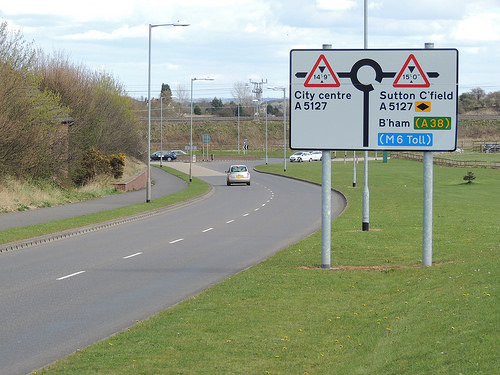 Photo taken looking east with the A5127 Birmingham Road crossing to the left and right. - 5/4/2016. The new line of the canal will follow the right hand (south side) of Falkland Road (the new A461 southern bypass) and pass under Birmingham Road directly ahead. The canal then needs to pass under the Lichfield-Birmingham-Redditch Cross-City railway line further ahead (AT GREAT EXPENCE!). Please visit the Lichfield Canal Tunnel Vision Appeal web site at www.lhcrt.org.uk/suchet.htm for details of the job ahead. Two bridges will be needed to take the canal (to the left) and the southern bypass road (to the right) under the railway. 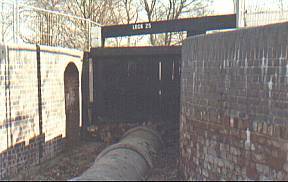 Photo taken looking back (with lock 22 near Wordsworth Close and Sanders Way behind the camera) towards the Lichfield-Birmingham-Redditch Cross-City railway line. - 5/4/2016. Left - An artists impression by Andrew Wood looking towards the southern bypass with the new canal tunnel on the left and the new road bridge on the right. 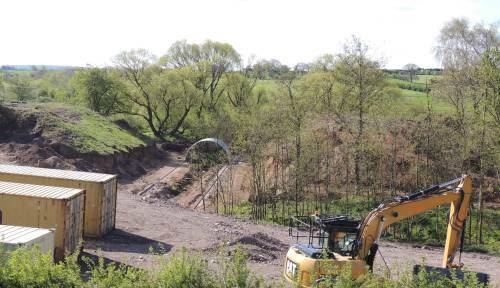 The culvert has already been installed under the roundabout on the opposite side of the railway embankment to connect with the new tunnel. 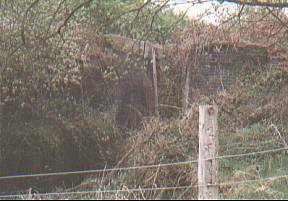 Whilst routine works still go ahead with modest funding streams, professional estimates put the cost of this railway tunnel upwards of £1 million. In reality, this must be in hand by the end of 2017 so that contract commitments by the County Council can be made with certainty. It can be done, it must be done, but institutional funding is not the answer. 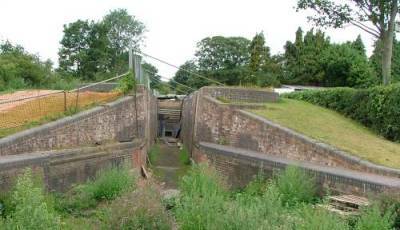 Success depends on the heart of the nation in responding to the Lichfield Canal Tunnel Vision Appeal now being launched. New Lock 22 4 miles 1443 yards or 7.76 Km from Ogley Junction. 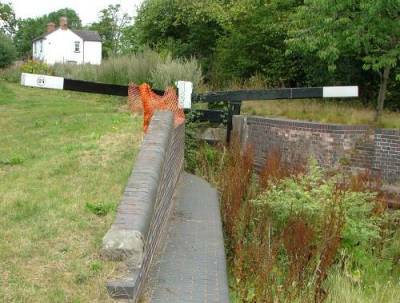 between Lock 22 (new route) & the "pinch point"
To the left is Wordsworth Close. The new route will merge in from the right. Ahead is the Pinch Point where the new southern bypass extension and the canal will have to share the gap between the properties of Wordsworth Close (to the left) and Marsh Lane (to the right). Photo taken looking east where the old and new canal lines will merge - 5/4/2016. Photo taken looking east with St. Johns Bridge, London Road in the distance - 5/4/2016. 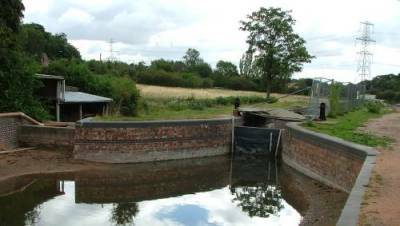 New or renovated Lock 23 5 miles or 8 Km from Ogley Junction. In the foreground is the site of Lock 23 that may be able to be restored and reused. In the foreground out of view to the left is the site of St. Johns Wharf and Basin. Photo taken looking east at St. Johns Bridge, London Road - 5/4/2016. The canal would have crossed the road and passed to the south of Gladhill Park and then runs beside the south side of Tamworth Road (A51). New Lock 24 5 miles 581 yards or 8.58 Km from Ogley Junction. 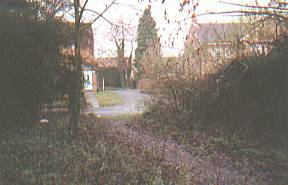 Cricket Lane (Ryknild Street Roman road) was crossed and old lock 24 was a little distance to the east. The start of "Borrowcop Locks Canal Park" public amenity walk. 5 miles 4 furlongs from Ogley Junction. Possibly to be retained as narrows - giving a NEW Rise of 0ft 0ins (0.0m). Rise of 10ft 6in (3.2m). Rise of 7ft 10in (2.4m). 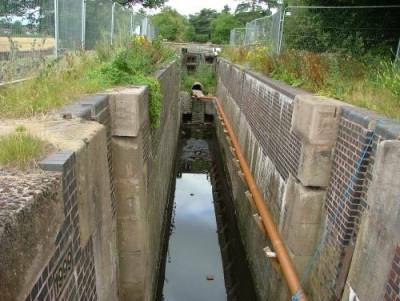 Lichfield Canal Pound 27 by Tamworth Road is ready for progressive watering right back to Lock 26, with puddled clay lining preferred where there will be much boat activity in a confined area. See the LHCRT Feet of Clay Appeal. 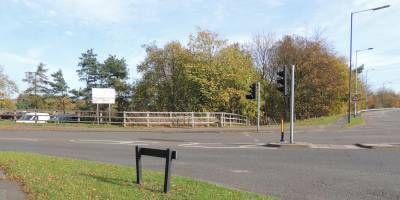 Eventually, pound 27 will extend through the A51 tunnel and up to Lock 27 on the other side of the road in Darnford Park. 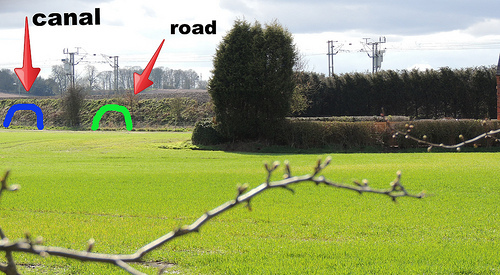 The original line was direct ahead across the A38 and then in an arc to the left to cross Tamworth Road (A51). The new route will reverse this. Tamworth Road (A51) - will be crossed just before the A38 as the canal turns to the north-east. 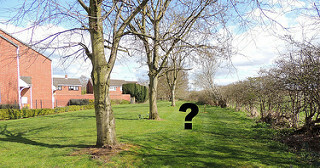 site of ---- New Staircase Locks 27/28 - 5 miles 1584 yards or 9.50 Km from Ogley Junction. This will be a pair of locks with a rise of 17ft 8in (5.4m). 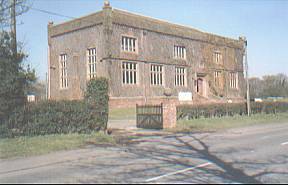 Access via Ryknild Street (corner of Tamworth Road (A51)) - enter Darnford Park car park and walk straight ahead and look to the right. "The completed crossing would be around 45m long, with a 4m wide navigable channel and 2m towpath." Darnford Lane. 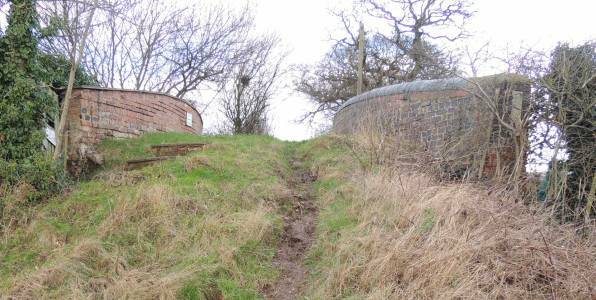 On the left is old lock 29 (taken looking west back to Darnford Lane). New Lock 29 6 miles 317 yards or 9.95 Km from Ogley Junction. Rise of 5ft 11in (1.8m). On the right a new lift bridge a little further east - to carry towpath back to the southern side of the canal. Lock 30 6 miles 1355 yards or 10.90 Km from Ogley Junction. Rise of 7ft 3in (2.2m). 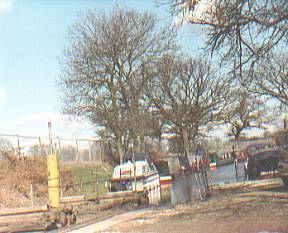 The canal is in water from this point and many narrow boats and others are based in this final stretch that leads to Huddlesford Junction. Photo taken from the east side of Capper's Lane looking east. 7 miles 53 yards or 11.31 Km from Ogley Junction. Photo taken from the south side of the bridge looking north - 20/12/2014. 23 miles 4 furlongs from Horseley Fields Junction, Wolverhampton. 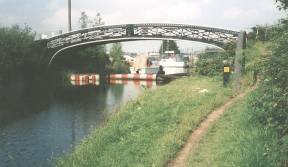 The foot bridge would lead to the towpath but is closed due to the private boat club that uses the end section of the Wyrley and Essington. Coventry Canal running to the south. 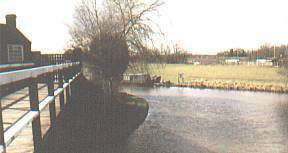 This photo of March 2003 is taken from the footbridge that would lead back to the Wyrley and Essington Canal but is closed due to the private boat club. Coventry Canal running to the north. Access to the canal is from Broad Lane at it's junction with Park Lane.